President Obama last week unveiled a series of measures to improve mental health care for veterans, ranging from awareness campaigns to increased funding for brain chips to treat post-traumatic stress disorder. Some advocates, however, do not believe Obama’s efforts go far enough. Part of the joint Veterans Affairs and Defense Department-led effort, for example, is a boost to the inTransition program, which aims to provide a “smooth and seamless” change for service members moving location or rejoining civilian life. Obama’s order will ensure all service members receiving Pentagon-sponsored mental health treatment at the time of their separation are automatically enrolled in the program, rather than just those who seek it out. Defense and VA vowed to develop a “comprehensive plan” for each service member with a psychological disorder to coordinate the conversion from active-duty to veteran care. Those changes notwithstanding, some worry the fix is cosmetic in nature and does not get to the deeper issue of access to care. Specifically, advocates say the administration still cannot proactively reach out to veterans to give them mental health care they have never solicited or previously received. It also faces the challenge of helping veterans who do not develop mental illness related to their service until several months or years after they separate from the military. Even Iraq and Afghanistan Veterans of America, which helped craft the proposals, said it is far from satisfied. Cameron Anestis, a marine who saw extensive combat during his tour in Iraq, returned home to Kentucky in 2009 having never sought mental health care through the Defense Department. He began developing psychological issues in the ensuing months, however, and both he and his family reached out to the local VA medical facility for assistance. But help did not come soon enough. He fatally shot himself at his home just hours after being turned away from a VA medical facility for the second time. Anestis, who was 21 years old when he died, is survived by his wife and young daughter, who are currently suing the federal government for $22.5 million. Brian Portwine, an infantryman who served multiple tours in Iraq between 2006 and 2010 and was struck by a rocket-propelled grenade, as well as an improvised explosive device during his service, also failed to get the help he needed. Portwine came home in 2008 complaining of a “scrambled brain,” his mother, Peggy, recently told a congressional committee. He was redeployed nonetheless, and while back in Iraq suffered with anxiety, depression, insomnia, poor concentration and hypervigilance. He never sought help for his illnesses, however, so he was never sent home. When he did return home at the end of his tour, he was deemed at risk for post-traumatic stress disorder, but Defense and VA did not assign him to any specific treatment facility. Portwine committed suicide in May 2011, just five months after he was discharged. The inTransition program was launched in 2012, so it could not have helped Anestis or Portwine, no matter its design. The concern, however, stems from the idea that even the updated initiative would not have flagged the clearly troubled veterans. Because the outgoing service members were not previously in the mental health system, they would be free to reenter civilian life without any mandatory psychological care. Anestis and Portwine’s stories are hardly unique; according to widely circulated and discussed VA data from 2010, an average of 22 veterans committed suicide each day in 2010. Putting political will behind that figure has nonetheless proven difficult. Whether or not Obama can or will tackle veterans' suicide on his own, he made clear the issue is a priority while announcing his initiatives last week. Obama’s proposals -- 19 in all -- include boosting research into PTSD, early suicide detection and $34.4 million to study individuals who have recently survived a suicide attempt. He is also promoting mental health awareness, increasing mental health training and supporting efforts to take the stigma out of seeking help. While the Republican critiques were expected, Obama’s political allies also said the president’s strategy could not alone solve the PTSD and suicide crisis facing the nation’s most recent crop of veterans. Rep. Tim Walz, D-Minn., introduced a bill in the House with Miller and others that would require the Pentagon to review dismissals of veterans to ensure any less than honorable discharge was not due to a psychological disorder. Any reversal would enable former service members who were not previously eligible to seek VA care. The Clay Hunt Suicide Prevention for American Veterans Act is named for an Iraq and Afghanistan Marine who shot and killed himself in 2011. 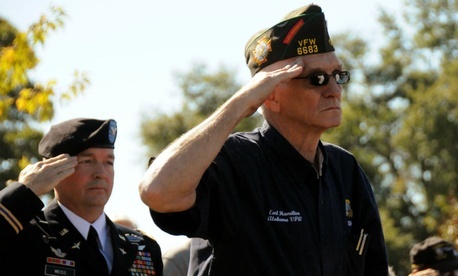 An internal IAVA member poll found 68 percent of VA mental health users reported challenges in scheduling an appointment, and 31 percent of respondents said they had thought about taking their own lives since joining the military. Rieckhoff said IAVA will continue to pressure Obama to issue an executive order focused specifically on veteran suicide, offering six principles for any actions: access, capacity, care, crisis, continuity and community. With the start of September ushering in Suicide Prevention Month, advocates such as IAVA hope the time is ripe for real reform.